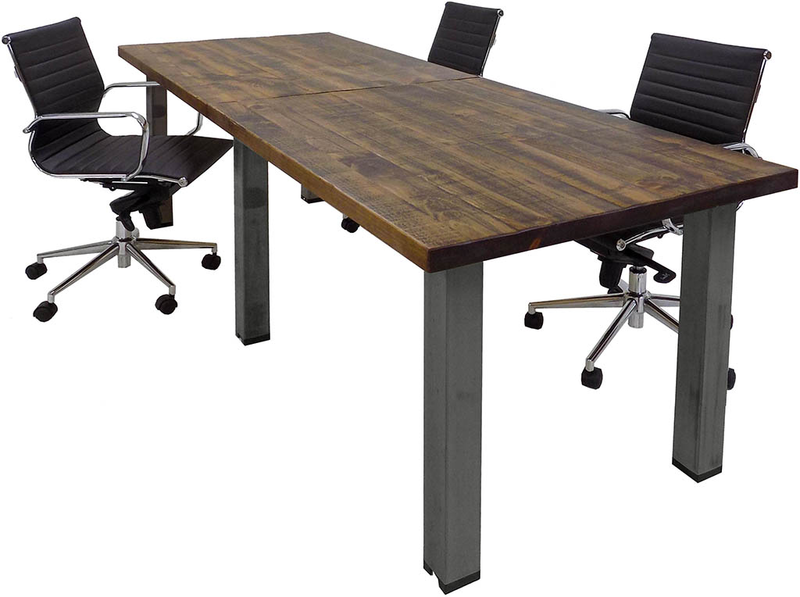 This industrial chic conference table series features beautifully handcrafted solid wood table tops made in the U.S.A! 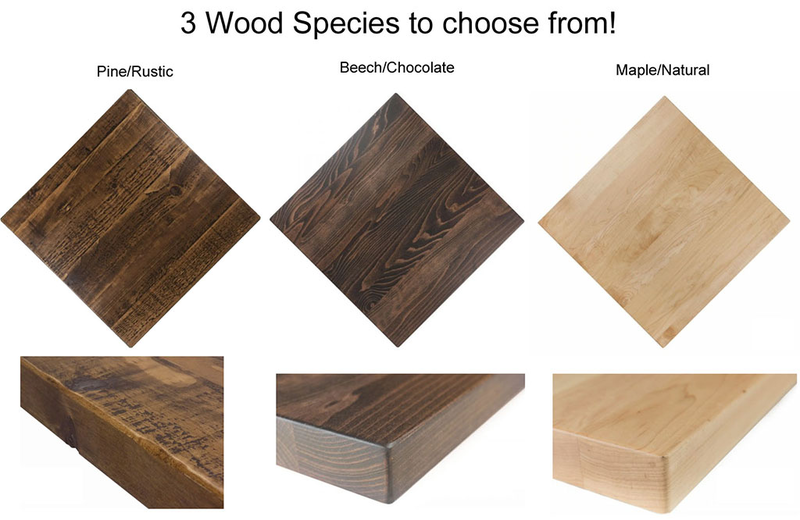 Choose from three wood species/finishes full of unique, real wood charm. 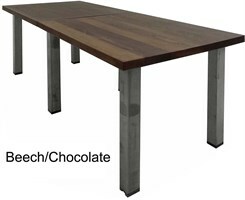 Tables are supported by a clear coated industrial look steel post leg that highlights the interesting character of oxidized steel. 8' x 3' table sold above. 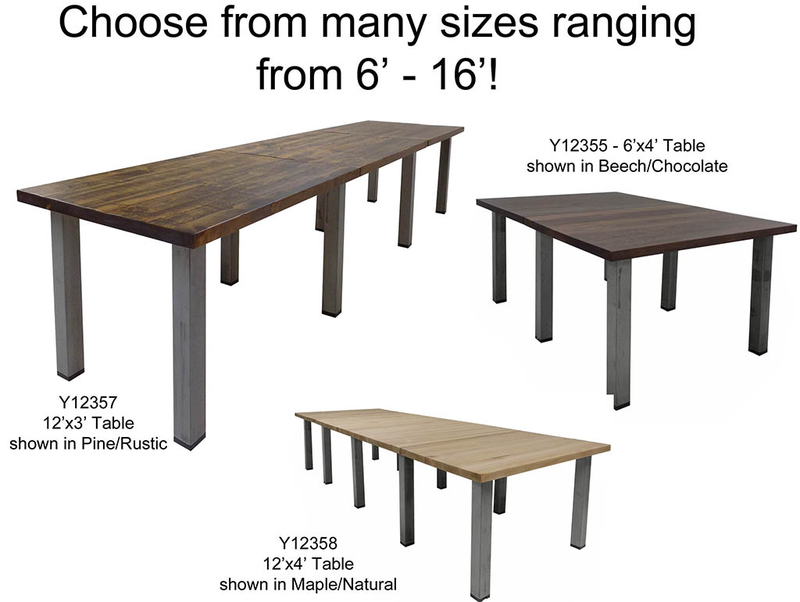 See other table sizes sold below. Measures 96" long x 36 "wide x 29-3/4" high overall. Includes two 3' x 4' table tops with six steel legs. Seats a maximum of 8. Shipping weight: Maple or Beech 204 lbs. / Pine 130 lbs. Ships with legs detached. PRICE INCLUDES SHIPPING! (Truck shipment - see Terms and Conditions). IN STOCK! 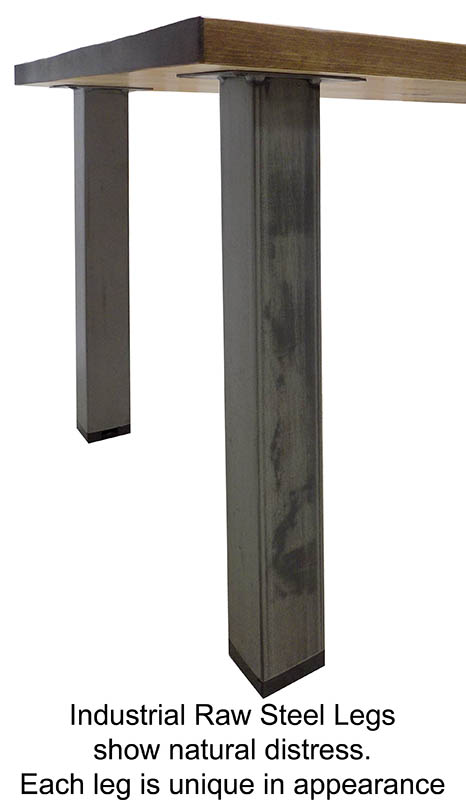 * Square steel leg posts provide a trendy industrial appearance. 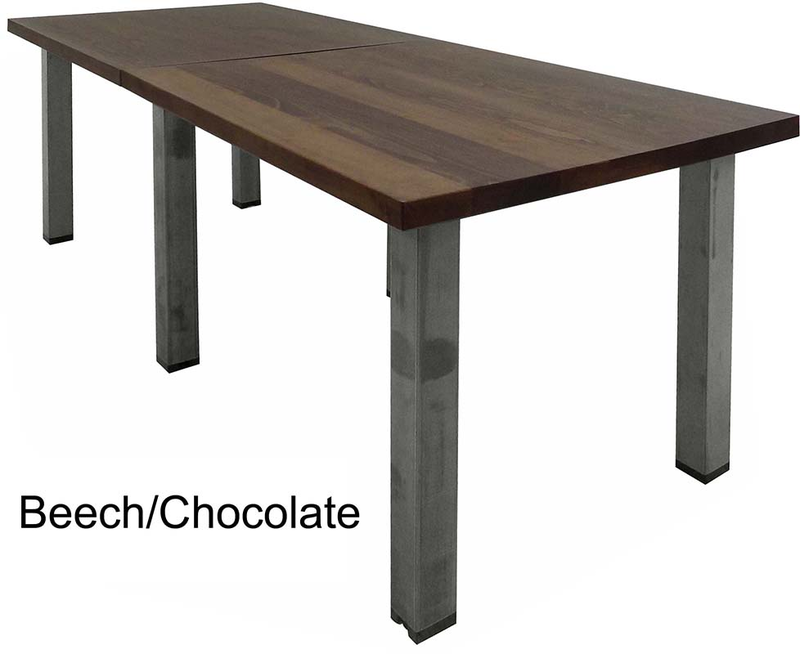 * Steel legs have a clear coat protection to display the interesting appearance of oxidized steel, welds and imperfections. * Steel legs also serve as connecting brackets between top sections. 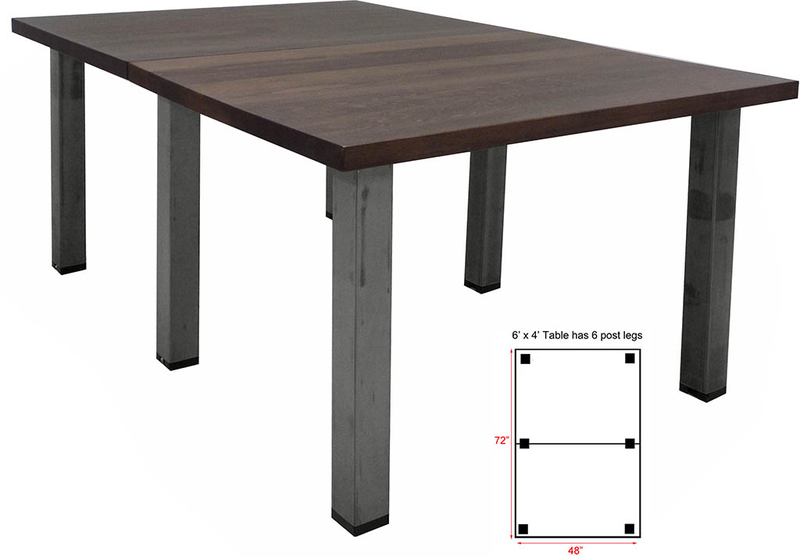 Tables can easily be reduced in size or expanded if needed. * Leveling glides on all legs for uneven floors. Handcrafted to show character not possible on factory produced furniture. 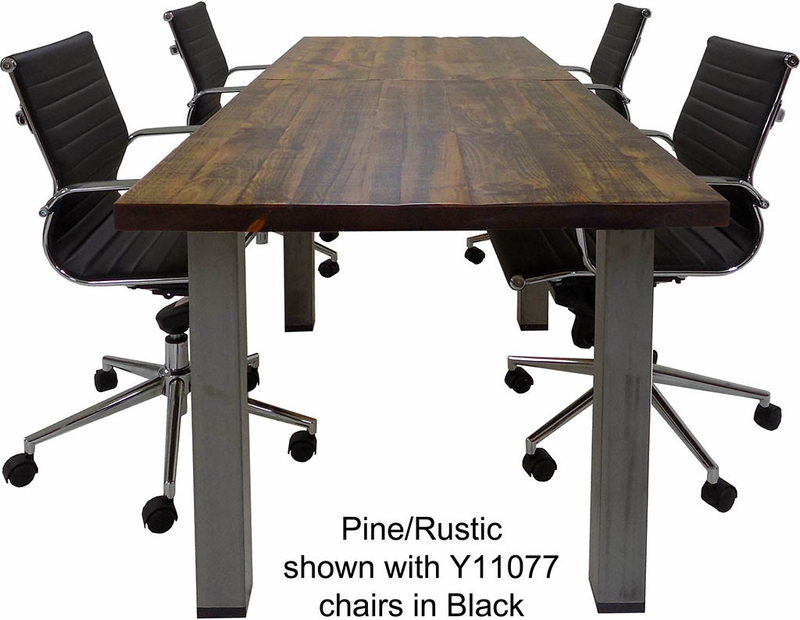 Color variation, knots, uneven surfaces and a mixture of wood grain patterns is to be expected and is part of the beauty of the rustic finish. 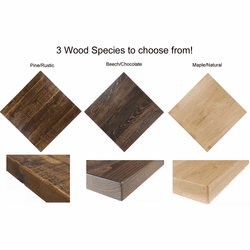 Tops vary in color from medium to dark brown with some knots and mixture of wavy, curly and straight grain. Hand sanded to leave rustic texture and ridges. Measures 72" long x 48" wide x 29-3/4" high overall. 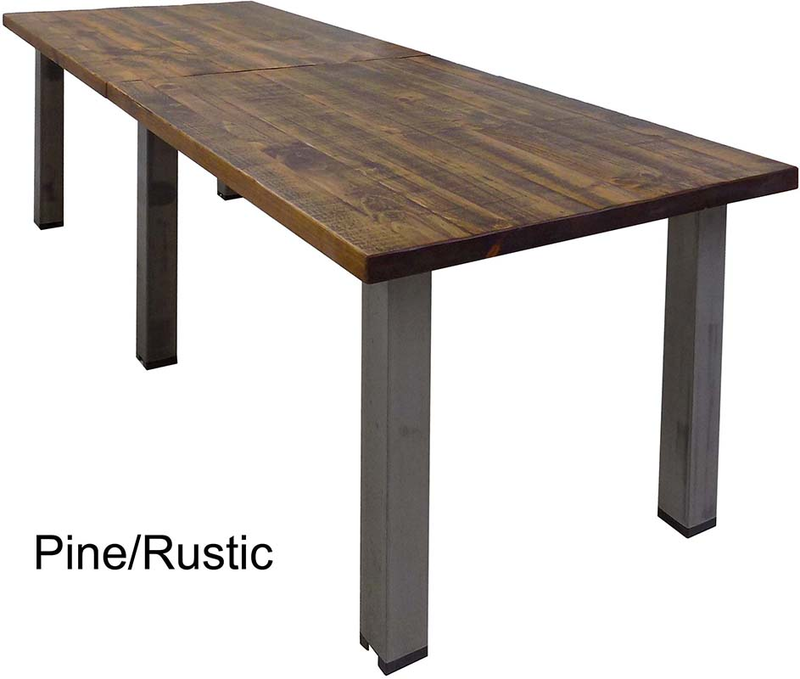 Includes two 3' x 4' table tops with six steel legs. Seats a maximum of 8. Shipping weight: Maple or Beech 204 lbs. / Pine 130 lbs. Ships with legs detached. PRICE INCLUDES SHIPPING! (Truck shipment - see Terms & Conditions). IN STOCK! Measures 108" long x 48" wide x 29-3/4" high overall. 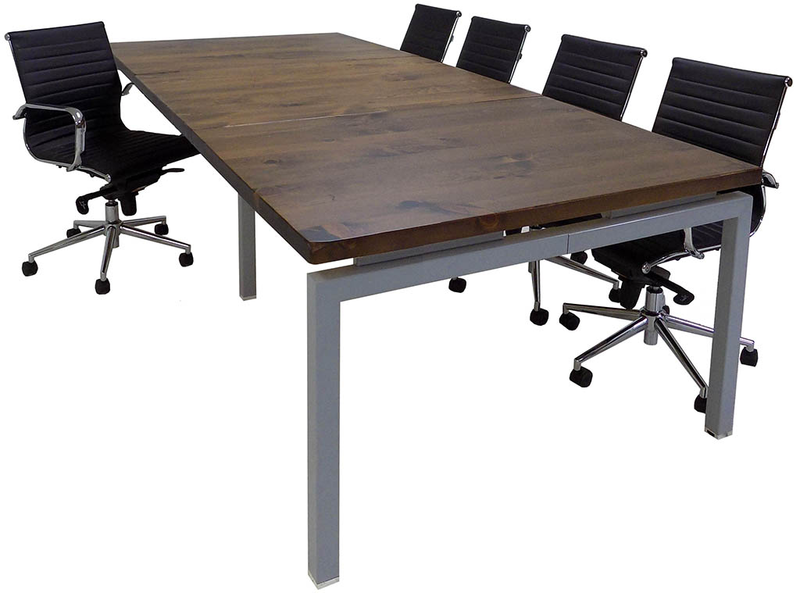 Includes three 3' x 4' table tops with eight steel legs. Seats a maximum of 10. Shipping weight: Maple or Beech 299 lbs. / Pine 188 lbs. Ships with legs detached. PRICE INCLUDES SHIPPING! (Truck shipment - see Terms & Conditions). IN STOCK! 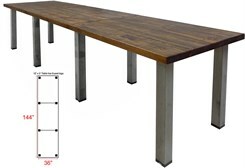 Measures 144" long x 36" wide x 29-3/4" high overall. Includes three 3' x 4' table tops with eight steel legs. Seats a maximum of 12. Shipping weight: Maple or Beech 299 lbs. / Pine 188 lbs. Ships with legs detached. PRICE INCLUDES SHIPPING! (Truck shipment � see Terms & Conditions). IN STOCK! Measures 144" long x 48" wide x 29-3/4" high overall. 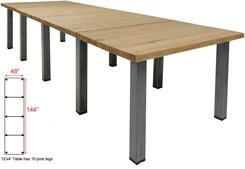 Includes four 3' x 4' table tops with ten steel legs. Seats a maximum of 12. Shipping weight: Maple or Beech 394 lbs. / Pine 246 lbs. Ships with legs detached. PRICE INCLUDES SHIPPING! (Truck shipment - see Terms & Conditions). IN STOCK! 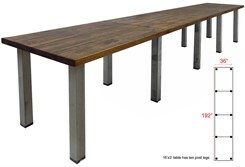 Measures 180" long x 48" wide x 29-3/4" high overall. 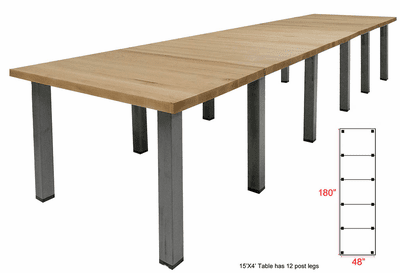 Includes five 3' x 4' table tops with twelve steel legs. Seats a maximum of 14. Shipping weight: Maple or Beech 489 lbs. / Pine 304 lbs. Ships with legs detached. PRICE INCLUDES SHIPPING! (Truck shipment - see Terms & Conditions). IN STOCK! Measures 192" long x 36" wide x 29-3/4" high overall. 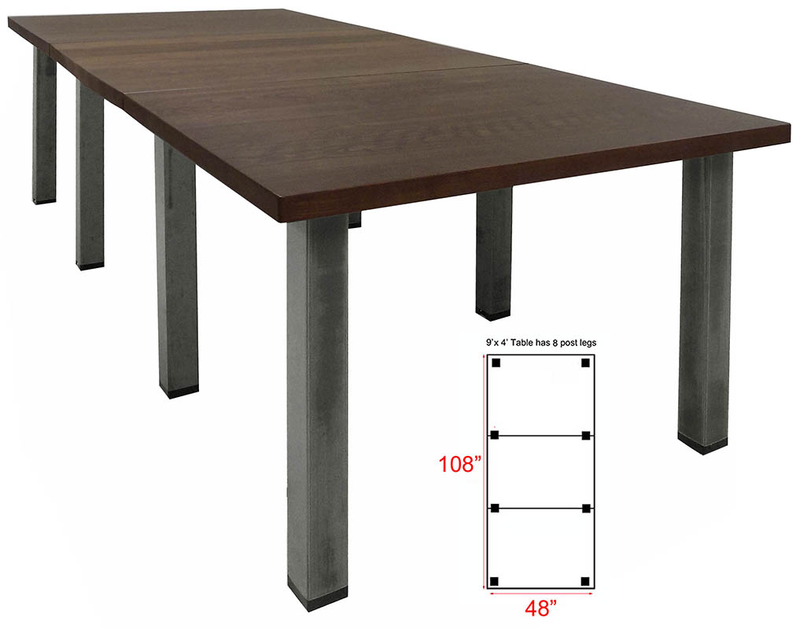 Includes four 3' x 4' table tops with ten steel legs. Seats a maximum of 14. Shipping weight: Maple or Beech 394 lbs. / Pine 246 lbs. Ships with legs detached. PRICE INCLUDES SHIPPING! (Truck shipment - see Terms & Conditions). IN STOCK!